This study, headed by Dr. Keith Wesnes of Cognitive Drug Research Ltd., was designed to determine how increased heart rhythm coherence, associated with the use of HeartMath techniques, affects cognitive performance. The study used a comprehensive battery of cognitive performance tests called the Cognitive Drug Research measurement system (CDR), which is typically used to assess the effects of pharmaceuticals on cognitive function. Eighteen healthy volunteers were fully trained on the CDR system prior to the baseline data collection. For the baseline measurement, each participant&apos;s ECG was recorded for a 10-minute period prior to completing the CDR tests, in order to compute heart rhythm coherence. Participants also completed a questionnaire that measured calmness and alertness. After the baseline measurement, the participants attended a one-day training program where they learned the Freeze-Frame, Heart Lock-In® and Coherent Communication techniques. They also practiced these tools while using the Freeze-Framer (now known as the emWave®) heart rhythm coherence system, to ensure they were making the shift into the coherent state and could identify what that state felt like. For the following seven weeks, they were instructed to use the Freeze-Frame technique whenever they experienced stress or emotional disturbance, and to use the Heart Lock-In technique three times per week for at least 10 minutes. In addition, they were encouraged to practice using the Coherent Communication technique when engaged in conversation. Seven weeks later, the participants again completed the data collection protocol. Results showed that participants exhibited a significant increase in heart rhythm coherence before they performed the CDR tests. Notably, this increase in heart rhythm coherence occurred even though the participants were not specifically instructed to use any of the tools they had learned in the program. Average improvements in quality of memory (composite score) after practicing the HeartMath tools for a 7-week period as compared to a group taking a pharmaceutical memory enhancer (labeled "Active") and a group taking a placebo. The CDR test results showed a highly significant improvement in the composite measure that reflects an individual’s ability to hold and retrieve information in memory. Data from previous clinical trials were used to compare the magnitude of this improvement with that achieved by groups taking pharmaceutical memory enhancers and placebo groups. 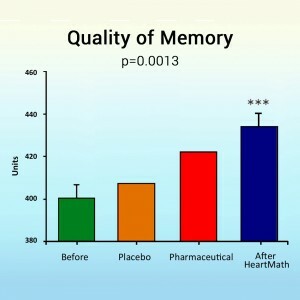 The magnitude of the memory improvement in the group practicing the HeartMath techniques was substantially larger than those found in trials using memory enhancers or placebos (see graph). Average improvements in quality of memory (composite score) after practicing the HeartMath tools for a 7-week period as compared to a group taking a pharmaceutical memory enhancer (labeled “Active”) and a group taking a placebo. A further analysis revealed a significant correlation between the increase in heart rhythm coherence and the improvements in both short-term and long-term memory observed in the post tests. Finally, the questionnaire results indicated that participants felt significantly calmer and more alert at the end of the study than they did at the beginning. In his review of the study&apos;s results, Dr. Wesnes concluded that practicing the HeartMath techniques over a relatively brief period of time appears to enhance an individual’s memory capacity and also improves self-reported calmness and alertness. The results of this study are also important on a broader level because they provide independent corroboration of previous research indicating that increasing heart rhythm coherence improves cognitive performance. A study conducted by the HeartMath Institute in 1998 demonstrated that increasing heart rhythm coherence resulted in significant improvements in discrimination and reaction time on a cognitive performance task. The UK study extends these results by showing that another, different aspect of cognitive function—namely, memory—can also be improved by coherence-building techniques. It is our hope that future studies will determine whether additional cognitive capacities can be similarly enhanced by practice of the HeartMath tools. For a detailed discussion of the intriguing connection between the heart and cognitive performance is in the scientific monograph, The Coherent Heart: Heart-Brain Interactions, Psychophysiological Coherence, and the Emergence of System-Wide Order.